That name has now been given to a new study from the Wilson Center’s Environmental Change and Security Program: Backdraft: The Conflict Potential of Climate Change Adaptation and Mitigation. Although the report never comments on the title directly, the implication of the analogy seems clear: Well-intentioned but ill-considered interventions can inflame the problems they were meant to solve. Studies of climate change and conflict have repeatedly concluded that climate change could create or exacerbate environmental challenges – food security, water availability, land use, natural disasters, etc. – that might in turn lead to conflicts within or between nations. Based on these studies, researchers, policymakers, and activists have argued that the costs associated with efforts to mitigate or adapt to climate change will be offset by dividends from the uninterrupted development that peace would allow. But the relationship between climate change and conflict is not so simple, counter the 10 authors of the eight pieces included in Backdraft, which was launched at a May 16 event at the Wilson Center moderated by Roger-Mark De Souza, director of population, environmental change and security (see video above). “Efforts to reduce our carbon footprint and lower our vulnerability to climate change [could] inadvertently exacerbate existing conflicts – or create new ones,” reads the opening paragraph of the report. The environmental journalist invited to respond to the report at the launch agreed. As a reporter with on-the-ground experience in Bangladesh, Haiti, Nepal, and Pakistan, Lisa Friedman, deputy editor for ClimateWire, has seen the very different effects climate change can have on the social and environmental systems of vulnerable countries. Backdraft, she said, provides a useful caution that responses to those effects can have their own unforeseen and unintended consequences. Book-ended by two policy reviews that draw examples from around the world to explain how alertness to unintended consequences should inform efforts to assess risk and devise adaptation programs, Backdraft features three case studies that consider the geopolitical risks of “green” technology, REDD programs (Reducing Emissions from Deforestation and Forest Degradation), and geoengineering. Supplementing these case studies are two spotlights. The first describes the civil tensions generated when foreign companies purchase huge parcels of land, often the best cropland available, to produce cash crops for the global economy. The second examines the social, economic, and ecological stresses created when forest or cropland is claimed for the production of biofuels. Of these five pieces, the case study on geoengineering and the spotlight on biofuel production trod the most familiar ground. Others have examined the real and potential geopolitical consequences of efforts to reduce CO2 emissions by burning biofuels instead of fossil fuels or to counterbalance the effects of those emissions. By contrast, Stacy VanDeever’s analysis of the conflict potential of mining and refining the minerals vital to so many green technologies will likely surprise many readers. 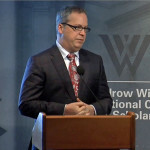 In his contribution to the report and in his presentation at the launch, VanDeever, associate professor of political science at the University of New Hampshire, argues that unless serious measures are taken to address underlying and chronic problems of governance, the transition to a “green” economy will likely only result in a “greening of the [resource] curse” – the tendency for states that depend too heavily on the wealth derived from extracted resources to develop malignant political economies. Many of the high technologies used to capture ever greater efficiencies for the green economy rely on exotic minerals like coltan, lithium, and rare earth metals. And in the countries where the mining and/or refining of these minerals are concentrated – VanDeever examines Bolivia, China, and the Democratic Republic of the Congo – one can observe many of the negatives associated with countries afflicted with the “resource curse” in the past: boom and bust cycles; environmental destruction and degradation; and political corruption and violence. In a question and answer session that followed the presentations, Geoff Dabelko, former director of ECSP and now director of environmental studies at Ohio University’s Voinovich School of Leadership and Public Affairs, repeated the essential point of Backdraft: Policymakers and analysts must think about the drivers that any action on climate change will add to a political-economic system and how that system will likely respond to those new drivers. This thought process should not be limited to the developing world, VanDeever added. One should also consider the consequences of the ways climate policy can be distorted in developed countries. In the United States, for example, the military habitually classifies the climate data it gathers, which generates anxiety about U.S. intentions, especially in particularly vulnerable parts of the world. Anxieties can lead to tensions, he noted, and tensions can lead to conflict. Friedman summed up the case studies in Backdraft as reminders that the story of recognizing and responding to climate change is also a story about institutions and governance. And that story is no easier to tell than the story of climate change: “It’s hard to put a picture of a good judicial system on the cover of a report,” she said. To tell these two complex and related stories properly, journalists must let go of stereotypes and other easy simplifications and gather real, on-the-ground details about the lives of actual people. But few news organizations now have the resources to send reporters to these climate vulnerable places or to give them time to get to know them, said Friedman, and those constraints make it harder to think outside the most readily available boxes. On a recent trip to Pakistan for a ClimateWire story, for example, Friedman also pitched some in-depth stories about the Pakistani elections to other publications. No one took them because, Friedman surmised, they didn’t fit into the “Pakistan=terrorism” box. Backdraft is the most recent addition to a shelf of new studies and reports calling for a major rethink, even a reboot, of national and international efforts to address climate change. The Climate Policy Initiative report released last month very effectively summarized the case – made in several quarters recently – against the United Nations Framework Convention on Climate Change negotiation process. In the May issue of The Atlantic, Charles Mann summarized the case against peak oil; that driver for the transition to cleaner, low-carbon renewables is gone, he wrote. And the weirdly cold spring weather in many parts of the United States this year seemed to confirm the conflicting data and findings of several recent studies. The non-linear process that is climate change appears to be even more non– than previously thought. The heat produced from the greenhouse effect is moving through Earth’s atmosphere, lands, and oceans in unexpected ways. Near the end of the event, Dabelko was asked about the wisdom of releasing the report: Will Backdraft muddle the message the public needs to hear about climate change? Pretending, for the public or policymakers, that a problem is smaller and simpler than it is will likely produce another rush of air. And the name for that is blowback. Michael Svoboda is an assistant professor of writing at George Washington University and a regular contributor to the Yale Forum on Climate Change and the Media. Sources: The Atlantic, Geophysical Research Letters, Nature, Science, Wilson Center, Yale Forum on Climate Change and the Media.